The latest innovation from Milltek Sport is ValveSonic, a revolutionary system that combines Milltek’s extensive knowledge and 31 years of performance exhaust design and manufacturing with cutting edge technology to create a new level of performance and sound. ValveSonic is available for a range of modern high-performance vehicles that come from the factory without valve-controlled exhaust systems. Milltek Sport creates for these cars a system that draws on the latest generation "OE" spec technology of electronic actuators, or valves, and combines this with its own electronic control unit to provide a limitless configuration of options to suit all types of owners’ preferences and requirements – regardless of how demanding they may be. The Milltek Sport ValveSonic ECU interfaces with the vehicle via the CAN-BUS network to enable it to monitor a vast range of parameters like vehicle speed, RPM, gear selected and more to automatically control the operation of the electronic valves located in the rear silencers. The ECU also enables the Milltek Sport installer to customise or remap the unit to suit the owners’ preference. For example, they may choose a higher or lower RPM opening-point based on their driving style or typical motorway cruising speed. In addition, the system provides a "Sport" button to enable the valves to be opened at any time to override the automatic controls build into the ECU – giving an extra dimension of ultimate control. Milltek Sport has an enviable reputation for quality and durability which, owing to extensive R&D, is carried over to the ValveSonic range. 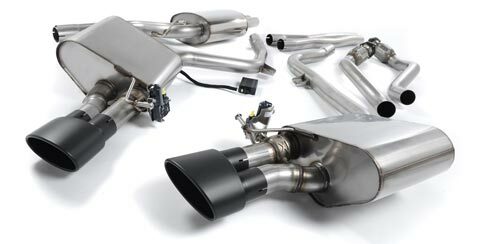 As with the regular Milltek Sport range, ValveSonic exhausts are made entirely from T304 grade non-magnetic stainless steel and the systems all being designed, developed and manufactured in the company’s own development centre in Derbyshire, England. ValveSonic is available from selected Milltek Sport resellers only to ensure the installation meets strict quality standards and is backed up with a high level of support. "OE" level of integration into the vehicles electronics to enable fast response and endless configuration options.